Gebel al-Mawta or Mountain of the Dead is neither ghoulish nor ghastly yet a tour of this ancient necropolis is likely to appeal to teen and tween's with a fascination for all things macabre. Even if bones no longer litter this honeycombed hill. The rock-cut tombs found here date from the 26th dynasty (roughly 6000 BC) through the end of the Roman era and all bear resemblance to ancient Egyptian burial practices. To date, there is no evidence that Christianity ever reached this outpost. Of significance are the Tomb of Niperpathot, Tomb of the Crocodile, Unfinished Tomb of Mesu-Isis and Tomb of Si-Amun for their magnificent and well-preserved wall paintings. One final note, Siwans took refuge in the tombs at various points in history and, today, avoid it after dark. 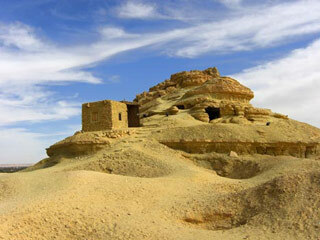 Gebel al-Mawta is rumored to be haunted. The ancient Egyptians may have built elaborate funerary complexes but they were neither obsessed with death nor afraid to die. Instead, the ancient Egyptians believed that life was part of the natural cycle, like the changing of the seasons, and that a person's akh or spirit lived on in the afterworld. The passage from Kingdom of the Living to the Kingdom of the Dead, however, was not guaranteed. The ancient Egyptians believed that resurrection was achieved only if the deceased's ba (persona) and ka (life force) were reunited each night. To ensure this, they took elaborate steps to preserve (mummification) and safeguard (tombs and pyramids) the dead. What's more, the ancient Egyptian's filled the deceased's tomb with lots of food and drink as well as all of things he made use of in life as they would be needed again in the next world. Deciphering wall paintings is fun, once. After the first tomb my 9-year-old daughter was more interested in taking pictures and sweeping with a date branch than making sense of figures. The risk of getting lost on the this small brown mountain is nil so we let her wander. Our only word of warning, 'Watch your step!' There was more than one hole in the rock-cut tombs we walked on.